If the colour of red litmus paper gets changed to blue, then it is a base and if there is no colour change, then it is either acidic or neutral. Thus, basic solution can be easily identified. Let us mark the three test tubes as A, B, and C. A drop of the solution in A is put on the red litmus paper. Same is repeated with solution B and C. If either of them changes colour to blue, then it is basic. Therefore, out of three, one is eliminated. Out of the remaining two, any one can be acidic or neutral. Now a drop of basic solution is mixed with a drop of each of the remaining two solutions separately and then the nature of the drops of the mixtures is checked. If the colour of red litmus turns blue, then the second solution is neutral and if there is no change in colour, then the second solution is acidic. This is because acidic and basic solutions neutralize each other. Hence, we can distinguish between the three types of solutions. kept in brass and copper vessels, the metal reacts with the acid to liberate hydrogen gas and harmful products, thereby spoiling the food. The dissociation of HCl or HNO3 to form hydrogen ions always occurs in the presence of water. Hydrogen ions (H+) combine with H2O to form hydronium ions (H3O+). Although aqueous solutions of glucose and alcohol contain hydrogen, these cannot dissociate in water to form hydrogen ions. Hence, they do not show acidic character. Acids dissociate in aqueous solutions to form ions. These ions are responsible for conduction of electricity. Colour of the litmus paper is changed by the hydrogen ions. Dry HCl gas does not contain H+ ions. It is only in the aqueous solution that an acid dissociates to give ions. Since in this case, neither HCl is in the aqueous form nor the litmus paper is wet, therefore, the colour of the litmus paper does not change. How is the concentration of hydroxide ions (OH−) affected when excess base is dissolved in a solution of sodium hydroxide? You have two solutions, A and B. The pH of solution A is 6 and pH of solution B is 8. 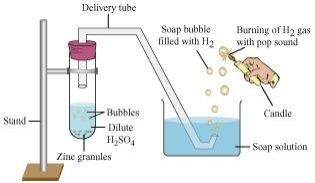 Which solution has more hydrogen ion concentration? Which of this is acidic and which one is basic? What effect does the concentration of ions have on the nature of the solution? Concentration of can have a varied effect on the nature of the solution. With an increase in H+ ion concentration, the solution becomes more acidic, while a decrease of H+ ion causes an increase in the basicity of the solution. Do basic solutions also have ions? If yes, then why are these basic? Yes, basic solution also has ions. However, their concentration is less as compared to the concentration of OH− ions that makes the solution basic. Under what soil condition do you think a farmer would treat the soil of his fields with quick lime (calcium oxide) or slaked lime (calcium hydroxide) or chalk (calcium carbonate)? The common name of the compound CaOCl2 is bleaching powder. Name the substance which on treatment with chlorine yields bleaching powder? Calcium hydroxide [Ca (OH)2], on treatment with chlorine, yields bleaching powder. Name the sodium compound which is used for softening hard water. Washing soda (Na2CO3.10H2O) is used for softening hard water. What will happen if a solution of sodium hydrocarbonate is heated? Give the equation of the reaction involved. When a solution of sodium hydrocarbonate (sodium hydrogencarbonate) is heated, sodium carbonate and water are formed with the evolution of carbon dioxide gas. (d) Bases turn red litmus blue and acids turn blue litmus red. Basic solution has a pH value more than 7. Since the solution turns red litmus blue, its pH is likely to be 10. (b) The solution contains HCl. (d) 16 mL of HCl solution will be required. Which one of the following types of medicines is used for treating indigestion? (c) Antacid is used for treating indigestion. Compounds such as alcohols and glucose also contain hydrogen but are not categorized as acids. Describe an activity to prove it. HCl dissociates into H+ and Cl− ions. These ions conduct electricity in the solution resulting in the glowing of the bulb. On the other hand, the glucose solution does not dissociate into ions. Therefore, it does not conduct electricity. Why does distilled water not conduct electricity, whereas rain water does? Distilled water is a pure form of water and is devoid of any ionic species. Therefore, it does not conduct electricity. Rain water, being an impure form of water, contains many ionic species such as acids and therefore it conducts electricity. Acids do not show acidic behaviour in the absence of water because the dissociation of hydrogen ions from an acid occurs in the presence of water only. It is the hydrogen ions that are responsible for the acidic behaviour. Equal lengths of magnesium ribbons are taken in test tubes A and B. Hydrochloric acid (HCl) is added to test tube A, while acetic acid (CH3COOH) is added to test tube B. In which test tube will the fizzing occur more vigorously and why? Fresh milk has a pH of 6. How do you think the pH will change as it turns into curd? Explain your answer. Plaster of Paris should be stored in a moisture-proof container. Explain why? Plaster of Paris (POP) should be stored in a moisture-proof container because Plaster of Paris, a powdery mass, absorbs water (moisture) to form a hard solid known as gypsum. What is a neutralization reaction? Give two examples. A reaction in which an acid and base react with each other to give a salt and water is termed as neutralization reaction. In this reaction, energy is evolved in the form of heat. (ii) During indigestion (caused due to the production of excess of hydrochloric acid in the stomach), we administer an antacid (generally milk of magnesia, which is basic in nature). The antacid neutralizes the excess of acids and thus gives relief from indigestion. Give two important uses of washing soda and baking soda. (a) It is used in glass, soap, and paper industries. (b) It is used to remove permanent hardness of water. (a) It is used as baking powder. Baking powder is a mixture of baking soda and a mild acid known as tartaric acid. When it is heated or mixed in water, it releases CO2 that makes bread or cake fluffy. (b) It is used in soda-acid fire extinguishers.